3-part Series: Live powerboat racing production. How digital delay became an invisible advantage. Most sanctioned offshore power boat races are held in the ocean, generally at some distance from most landlocked spectators. The multi-million dollar offshore powerboat racing circuit has recently learned it can attract people who can afford to race and crowds to watch, even in fresh water more than 700 miles inland. 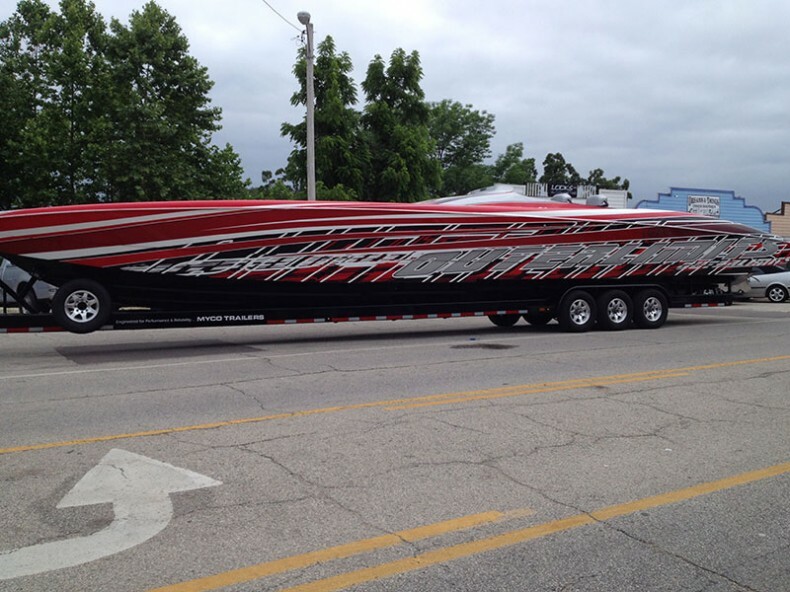 The Lake of the Ozarks has become a world-class boat racing venue for two reasons. It provides more opportunities and angles for powerboat race spectators to be a part of the action than most ocean venues. 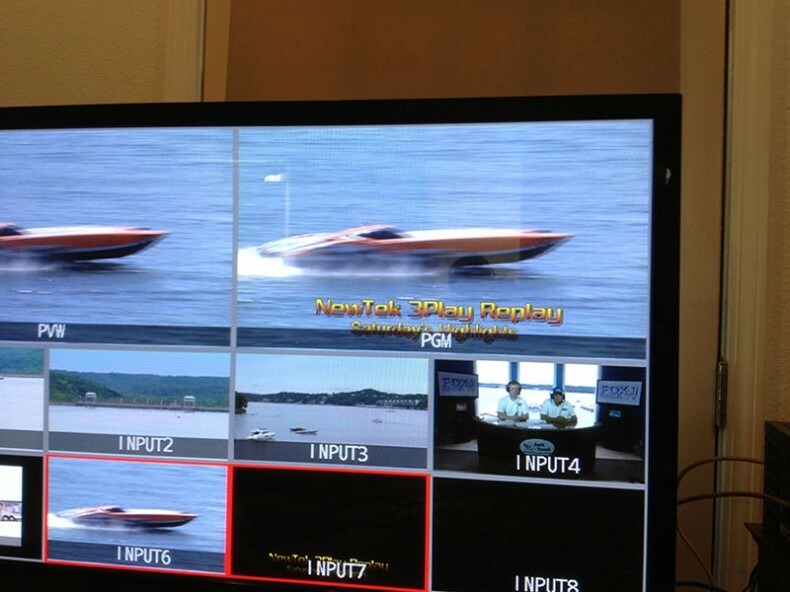 It is also the only venue that produces its own broadcast radio and television coverage of organized Powerboat racing events. That coverage consists of two consecutive days, three hours each, of live television programming broadcast on KRBK FOX 49 in Springfield MO, FOX 32 in Columbia MO and simultaneously streamed to the Internet. Lake of the Ozarks is a 90 mile long private manmade lake, built 80 years ago for hydropower generation. The water and submerged land it covers is owned by a regional power company and patrolled by the state highway patrol in boats. There is no daytime speed limit on the Lake. Much of the surrounding lakefront property is owned and occupied by private homes, private docks, condos, marina restaurants and gas docks. Boats have been competing for speed at the Lake of the Ozarks since the first two motorboats found themselves side by side. Boats got faster, owners got more competitive and in 1988 an annual local boat race for top-speed bragging rights was organized by a local Fire Department with proceeds dedicated to local charities. That event, called the Shootout, has grown to a world-class racing event held in late August, typically attracting more than 100,000 spectators. 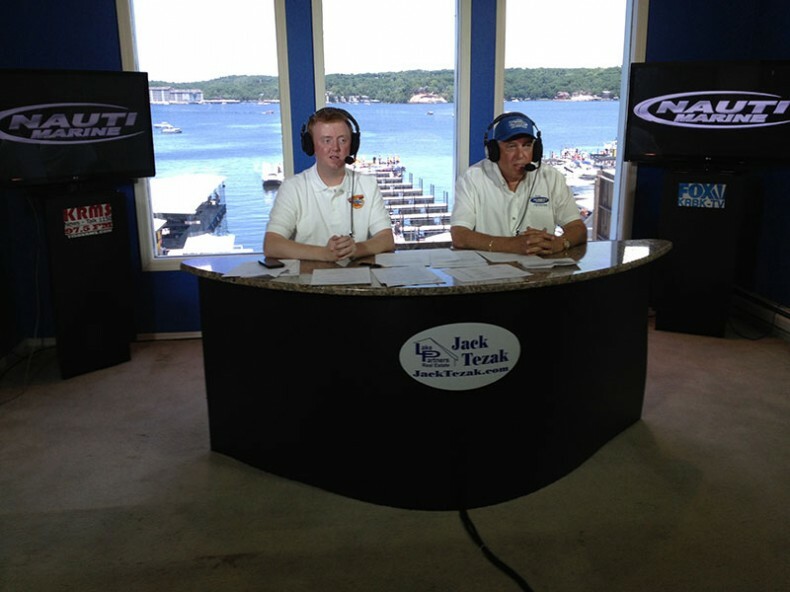 The most recent televised racing event was a newer second racing annual event, Lake of the Ozarks Powerboat Invitational. It was held June 7-8, 2014. Many of the fastest boats in the world come to compete at both races because they love the location. Boat owners take this race seriously. Shown here is the 46-foot Outer Limits. Live regional broadcast coverage is all thanks to Viper Communications radio station KRMS in Osage Beach MO. KRMS began broadcasting live radio coverage of the Shootout in 2000. Four years later the station put a single NTSC analog video camera in the window overlooking the Shootout course. It was fed to Charter Communications Cable, who carried the single-camera video with the radio station audio on a local public access channel. 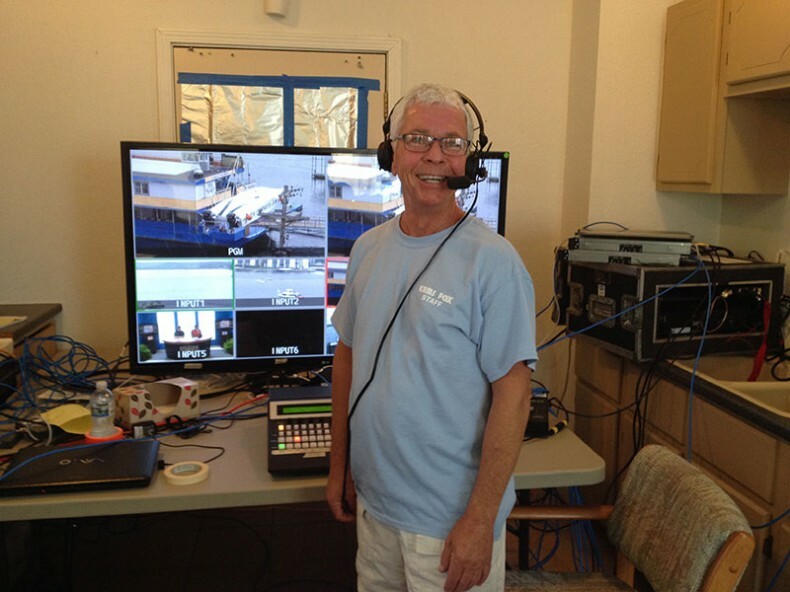 Ten years later, powerboat racing television production at the Lake of the Ozarks has evolved to as close to ESPN quality as it can get on a radio station budget in a market so small is doesn’t have a number. As things sometimes happen, some right-place-right-time magic kicked in and the right group of broadcasters found each other. Sharing a common goal, we pooled our resources, cranked up our creativity, planned, promoted, produced and turned a local event into a live regional television broadcast sports event, still on as close to zero budget as possible. Powerboat races are two day events. Like most motor racing, competitors either compete point to point in a straight line for top speed, or in multiple laps around an oval. The both produce the unique sound of thousands of horsepower roaring across the lake. The water also makes the challenge of visualizing where all that noise is coming from a bit complicated. The biggest challenge is backhaul. With hops up to three miles across a wide lake, RF is the only answer. Author Ned Soseman was technical director for the two-day broadcast. In the SD analog days, inexpensive 2.4 Ghz license-exempt microwave systems were good enough. Cameras were on solid land for stable microwave signals and the cable TV feed was backhauled to head end by the cable company through its own cable with an analog modulator. It was good enough for public access cable and funded by traded spot time. In 2012 the ante was raised, as KRBK FOX 49 in Springfield MO, which the author happens to be associated with, agreed to carry two days of the races, Noon to 3pm, Saturday and Sunday. Until then race coverage was limited to local AM radio, local cable and the Internet. KRBK uses a leased satellite channel to distribute its programming on an unencrypted ASI stream to its five-transmitter, single-frequency network (SFN) covering the Springfield MO market. That ASI stream was used as the live feed source to FOX 32 in Columbia MO, making it the least challenging of backhauls. More challenging was transporting live broadcast quality video the 90 mile distance from the Lake of the Ozarks to Springfield MO. At about that time, the broadcast market was being introduced to bonded cellular equipment. The author contacted several bonded cellular manufacturers. Dejero and LiveU stepped up and provided loaner gear. Both companies sent an engineer with their gear to guarantee success. 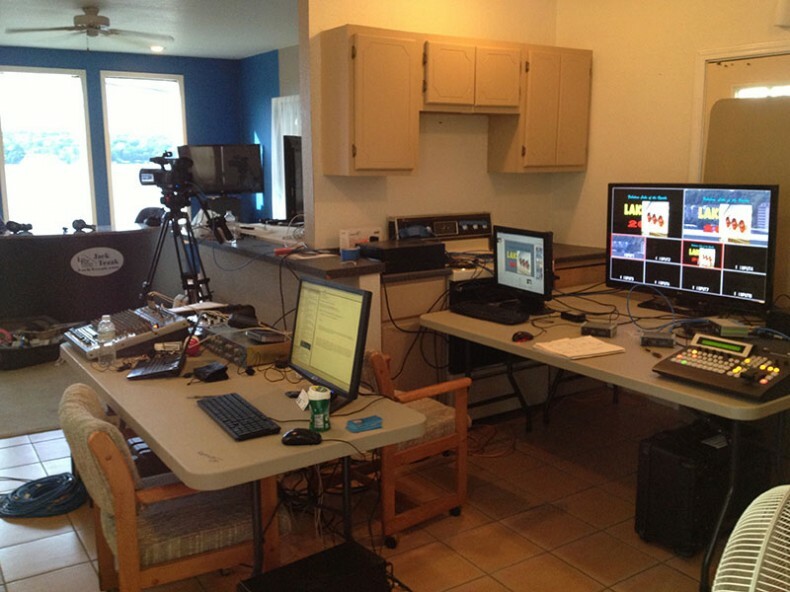 The vacant apartment / economy-sized control room was staffed with talent from the local TV stations. One bonded cellular system from Dejero was dedicated for program backhaul to KRBK. The transmitter was installed in the Lake control room, fed with embedded SDI program content and connected to the Internet. A Dejero server at KRBK received the Internet signal and converted it to SDI. The other Dejeros and LiveUs were used to transport camera signals to the on-site control room. Ultimately, bonded cellular units were used successfully on anchored boats, too unstable for traditional microwave. One unit went up in a helicopter with an iPhone camera source. It was on-air live for nearly 10 minutes, flying over of the race course lined with thousands of spectator boats tied together. That impressive beauty shot was something never before seen on live TV at the Lake and it created quite a buzz. In 2013, the production switched to HDTV and KRBK leased its own LiveU bonded cellular system. This set the stage for a new production experience and locked in LiveU for station backhaul. Fortunately, LiveU continues to support the powerboat racing charity productions and loaned the required equipment to support the course cameras. The company also recognized KRBK’s LiveU system needed upgrading and took care of that, too. Bonded cellular has proven to be stable and reliable even with only a couple of cell towers in sight, but it does have digital latency. The amount of delay depends on the cellular network and desired signal quality at the output of the bonded cellular server. At the Ozarks powerboat racing locations, the typical number of simultaneous cell phone users on one tower may number a thousand or so. However, during racing events, the number of cell phones connected to local towers might spike in the high tens of thousands. There were also some bandwidth hogs such as live television production, negotiating and pushing three isolated camera feeds down the cellular pipe. Limited cellular bandwidth technology can add delays similar to that encountered over a satellite feed. helping keep them on top of the action. When the delays of all live cameras are equally matched, viewers won’t notice. But, it does make production more interesting. The delay of each camera connection was set to match that of the slowest camera connection. On race days, the slowest reliable connection required nearly a four second delay. Delays over a fraction of a second in live multi-camera production can frustrate camera operators, directors and talent. Some might call it unacceptable. 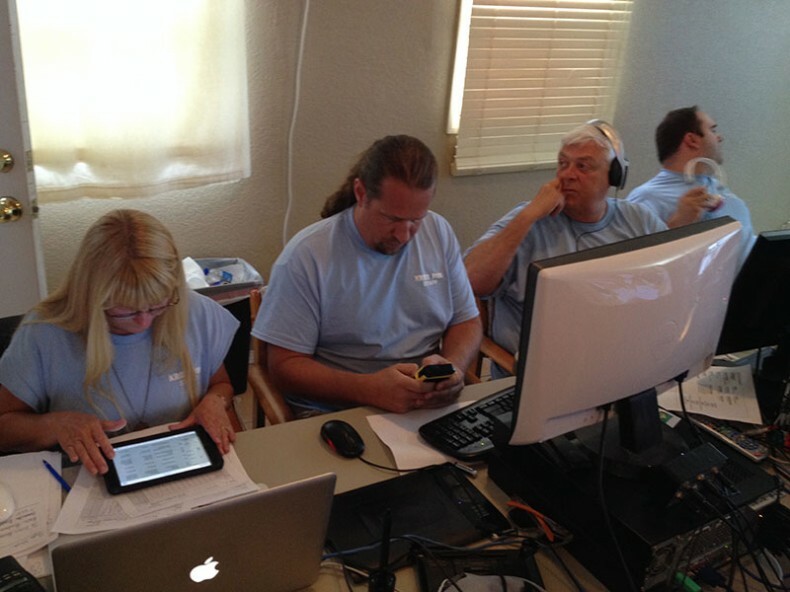 Production staff shown here include (L-R): Carolyn Warnebold tracking stats, graphics operator Baub Eis, Dennis Klautzer playing spots, GoPro playbacks and giving TV station cues, and John Rogger mixing live radio/TV audio. Long delays between the camera and control room require camera people to essentially direct themselves. Camera positions are assigned shots and sometimes specific boats to track, but not all sports action is predicable. Equally delayed live action feeds make directing feel more like changing channels on a TV using a dedicated control surface. The director can yell at the TV but it doesn’t do any good. Camera operators are a full four seconds ahead of what’s seen inside the control room and studio. In the case of live powerboat racing production with kind much delay can actually turn into a curious advantage. It gives camera operators the ability to alert the director and producer the moment something of interest occurs on the course. It feels like something from the Back to the Future movies. delay in sound and video. Studio talent and the control room are literally isolated in a delayed world. Announcers call the race watching delayed cameras on a multi-viewer studio monitor fed by a HDMI splitter at the switcher’s multiviewer output. Everyone in the studio and control room is in sync, seconds in the past. Camera operators and the rest of the world are seconds ahead. At a high speed sporting event, an advanced heads-up can be remarkably useful and completely invisible to viewers. What’s not to like about a secret connection to the future? The next component in this three-part series will discuss unique aspects of the production. The last part will conclude by describing how the broadcast coverage is packaged as live programming, marketed and sold. Extremely cool Ned. Nice to see you out in the field!